This article is about Zero Suit Samus's appearance in Super Smash Bros. Ultimate. For the character in other contexts, see Zero Suit Samus. Zero Suit Samus (ゼロスーツサムス, Zero Suit Samus) is a playable character in Super Smash Bros. Ultimate, officially confirmed on June 12th, 2018. Once again, Zero Suit Samus is unconnected to the standard playable Samus, although she temporarily transforms into the latter during her Final Smash. Zero Suit Samus is classified as fighter #29. As in Smash 4, Alésia Glidewell's portrayal of Zero Suit Samus from Brawl was repurposed for Ultimate. 6 Classic Mode: Grapplers! Whips! Claws! Play VS. matches, with Zero Suit Samus being the 19th character to be unlocked. Clear Classic Mode with Fox or any character in his unlock tree, being the second character unlocked after Captain Falcon. Have Zero Suit Samus join the player's party in World of Light. With the exception of the third method, Zero Suit Samus must then be defeated on Brinstar. Possibly as a result of being considered a dominating top tier character throughout the lifetime of SSB4, Zero Suit Samus has received a mix of buffs and nerfs in the transition to Ultimate, but was objectively nerfed overall as a character. Her most notable nerf was to her outstanding punish game, as her combo potential, while still usable, has been toned down noticeably. Her down throw can no longer combo as reliably as in the previous game past very low percentages, her up aerial's hitbox has been worsened and her down smash paralyzes opponents for much less time, worsening several of her setup moves and making it more difficult to capitalize on them. Furthermore, the changes to the knockback physics make it more difficult for her to string her moves into the other. Zero Suit Samus's recovery, previously one of the best in the game, was also nerfed, as Plasma Whip takes much longer to grab an edge and has reduced tether range. Lastly, nerfs to her forward smash's new sourspot, forward aerial's power, and back aerials and Boost Kick's hitboxes, make it harder for her to score KOs. However, Zero Suit Samus does benefit overall from the universal changes to gameplay mechanics. The faster movement speed further enhances her already excellent mobility (now possessing the fastest initial dash in the game and a usable dash-dance), improving her approach and as such, her "hit and run" playstyle. The reintroduction of directional air dodging improves her juggling capabilities, and the universally reduced landing lag allows her to retain some of her combo game. She has also directly received some useful buffs: her down tilt, arguably her worst move in SSB4, has reduced lag that gives it newfound combo potential. Her grab game hasbeen improved as a whole, as her grab, previously one of the laggiest in the game, has been sped up, making it less risky to use, and her up throw has increased knockback, granting her a new KO move. Finally, her entire special moveset has seen many improvements, as Paralyzer charges and fires shots faster, while Plasma Whip can now send opponents towards her for new setups if the button is held, and both Plasma Whip and Boost Kick have restored some of their lost KO power from Brawl and SSB4's initial release, respectively. In the end, Zero Suit Samus remains a high-risk, high-reward character whose learning curve is higher than in SSB4, with her combos and punishes being largely more different than in SSB4, and her reward being less fundamentally overpowering. However, her few buffs and the different engine of Ultimate benefit her in ways that make it difficult to determine how viable she is in comparison to SSB4, though general consensus is that she remains a viable character. Much like Cloud, Mario, and Sonic, and in contrast to how other former SSB4 top tier characters were nerfed much more heavily, Zero Suit Samus continues to be an effective character, with players such as Choco, Juice and Marss finding notable tournament success with her. As with all veterans returning from SSB4, Zero Suit Samus's model mostly features a more subdued color scheme, though her eyes are a more vibrant green and less blue. Most of her suit is now a lighter shade of blue with a matte texture, which matches her in-game design in Metroid: Samus Returns. While Zero Suit Samus retains some design elements from SSB4, the material of her Zero Suit no longer looks homogeneous. Her physique has been altered as well, with her figure now being leaner and more muscular, as in Samus Returns concept art. Zero Suit Samus has a new idle animation. She now holds the Paralyzer in a high ready position, similar to one of her idle poses and victory animations. Zero Suit Samus's grab aerial now droops and lays on the ground during landing lag. Zero Suit Samus's walking and running animations have been altered slightly; she now bobs with each step. Zero Suit Samus now strikes a pose during her down taunt animation. The changes to powershielding both help and hinder Zero Suit Samus. They make it easier for her to punish out of shield due to her quick attack speed, but also make her easier to punish out of shield due to her reliance on landing aerials. The reintroduction of dash-dancing improves Zero Suit Samus' mindgame potential. Like all characters, Zero Suit Samus's jumpsquat animation now takes three frames to complete (down from 4). Zero Suit Samus runs significantly faster (2.1 → 2.31). Zero Suit Samus's initial dash is significantly faster (1.7 → 2.42), now being the fastest in Ultimate. Zero Suit Samus walks slightly faster (1.4 → 1.47). Zero Suit Samus' air speed is slightly faster (1.2 → 1.26). The first hit can lock, at least on an incline. The entire move can no longer cross up shields. Its first and last hits also have slightly more ending lag (FAF 21 (first hit)/32 (third hit) → 24/35). The first two hits no longer have set knockback. It deals less knockback, making it weaker while not granting it any combo potential due to its high ending lag. It no longer renders her legs intangible, and can rebound with other moves, reducing its safety, especially against aerial attacks. It has reduced ending lag (FAF 36 → 30). It has an altered angle (60° → ?). Coupled with the above change, this gives the move combo potential. It has altered knockback (60 base/85 scaling → ?/?). It has a different animation: Zero Suit Samus uses her left leg for her down tilt instead of her right. The second hit can be angled, allowing her to both hit characters in the air more reliably when angled up, and hit smaller characters easier when angled down. Its hitboxes properly match its animation (in SSB4, the hitboxes would appear 1 frame after Zero Suit Samus extended her leg out for both kicks), giving it slightly less startup (frame 14 → 13 (first hit); frame 27 → 26 (second hit). It deals slightly less knockback (28 (base)/106/109 (scaling) → ?/?). It also has a new sourspot when hit up close. Altogether, this reduces its KO potential even further (despite already being one of the weakest forward smashes in SSB4). It has slightly more ending lag (FAF 63 → 65). It has reduced vertical range. The finisher's hitbox is closer to the ground, making it easier to follow up on at low percentages. It deals more knockback (70 (base)/145 (scaling) → ?/? ), making it able to KO at high percents, and no longer being the weakest up smash in the game. The hit is no longer treated as a projectile, meaning both characters experience freeze frames (or hitlag), instead of just the opponent. It deals significantly reduced knockback (50/40 (base)/90/50 (scaling) → ?/? ), which significantly reduces its stun time and as such, hinders its combo potential at low to mid percent. All aerials have less landing lag (10 frames → 6 (neutral), 16 frames → 10 (forward), 11 frames → 10 (back), 9 frames → 5 (up), 30 frames → 24 (down)). The move's lower landing lag, combined with Zero Suit Samus's faster jumpsquat, further improves its combo and set-up ability. It has slightly decreased range. The first hit has set-ups and KO confirms due to its lower landing lag. Forward aerial has an altered animation. The animation's positioning is also lower compared to SSB4, allowing her to hit shorter characters when performed in a rising short hop. The first hit transition faster into the second (frame 16 → 13). However, the move's duration was not reduced, effectively increasing the move's ending lag (by 3 frames), and thus diminishing its combo potential when not landing with it. The second hit deals less knockback (40 (base)/116 (scaling) → ?/?). However, the move's increased ending lag still renders the move incapable of comboing effectively in the air. The sweetspot has less range (5.5u → ?/? ), being stricter to the foot. It has a slightly altered animation. 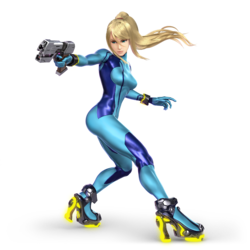 Zero Suit Samus is more upright while kicking and her left leg is more inward. The move's lower landing lag improves its ability to chain into itself and other moves when landing with it. It has less range, no longer hitting directly in front of Zero Suit Samus. It has slightly more ending lag (FAF 34 → 35). Along with the above change, this makes it more difficult to combo and juggle her opponents. It deals slightly less knockback (30 (base)/125 (scaling) → ?/?). This makes it better for juggling, but worse for KOing. The move's lower landing lag, combined with Zero Suit Samus's faster jumpsquat, means the landing hit can combo into forward aerial at lower percentages. It deals consistent damage (3% early/6% clean → 5%). It deals less damage than the previous clean hit, but more damage than the early hit. It has less ending lag, make it more useful to start combos without being used on landing. It bounces off of the first thing it hits, therefore it can only hit one thing before Zero Suit Samus uses the move again. It has less tether range. All grabs have less ending lag, especially her pivot grab (FAF 69 standing/72 dash/80 pivot → 59/67/62). Standing grab has a new hitbox on the hand that appears earlier (frame ?). The inability to pass through other fighters helps prevent dash grab from whiffing when used too close to the opponent. Zero Suit Samus has a new forward throw: a kick to the opponent's chest. New forward throw has altered knockback (50 (base)/75 (scaling) → ?/?). This results in reduced knockback, allowing it to set up more tech chase situations. It deals increased knockback (80 (base)/60 (scaling) → ?/? ), being able to KO before Sudden Death percents. It deals more damage (2% hit 1/3% throw/5% total → 4%/4%/8%). Its knockback was not compensated, and it has increased ending lag (FAF 46 → 52). This severely worsens its combo potential past very low percentages. It can fire a shot at any point while it's charging if the special move button is released; this will always result in the uncharged shot being fired. Paralyzer's shots are more orange in color. The sweetspot deals slightly more damage (7.5% → 8%), and has significantly increased knockback (45 (base)/105 (scaling) → ?/? ), restoring someof its lost KO power from Brawl. If the special move button is held during the move, it sends the opponent up and towards her, giving an opportunity for followups, similar to her Whip Lash custom move from SSB4. This version has more ending lag, but the hitbox lasts longer. The move takes much longer to tether to the ledge, and its tether range was also reduced. This makes the move much worse for recovery. Boost Kick no longer has RCO lag. It connects much more reliably. The grounded version's last hit deals more knockback (50 (base)/209 (scaling) → ?/?). The initial hit's hitbox has reduced range, to the point Zero Suit Samus has to be right next to the opponent in order for it to connect. The aerial version has increased landing lag (22 frames → 30). The aerial version also deals reduced knockback. The bounce from the footstool stomp is significantly shorter and has reduced ending lag, potentially allowing for followups. The move no longer grants intangibility on Zero Suit Samus's legs after the full body intangibility ends. Zero Suit Samus has a new Final Smash, Zero Laser. She summons her gunship, but temporarily dons her Varia Suit (using the same model as the playable version) and fires a single, long-lasting laser from the top of the ship, similarly to Aura Storm. The players choose where to aim the laser with a targeting reticle. Zero Laser deals significantly increased damage compared to a single laser (0.8% loop hits/10% last/17.2% total → 1.2%/1.6% loop hits/20%/25% last/51.2-66.6% total), and the last hit has much higher knockback, making it more powerful. Zero Laser only has a single use compared to Gunship's maximum of five shots, making it deal less total damage if all hits connect (86% → 66.6%). The last hit also has a delay before being fired, meaning the Final Smash can miss. This makes it less versatile and consistent. Its reduced base knockback however, hinders the ability to KO aerial opponent at early percentage from a back throw. Zero Suit Samus can crawl and wall jump. Zero Suit Samus possesses a tether attack and grab. 1.5% A knifehand strike, followed by a pistol-whip with her Paralyzer, followed by a 12-6 elbow. The first hit can lock, but the height of the hitbox makes it impossible to hit grounded opponents on non-slanted terrain. 8% (leg), 6.5% (body) A roundhouse kick. Can be angled. The down-angled version may cause tripping at low percentages. 5% (hit 1), 7% (hit 2) A butterfly kick-styled scissor kick performed from a variation of the 2000, a breakdancing move. It hits on frame 3, making it Zero Suit Samus' fastest tilt attack. It is also one of only two moves that hits in front of and behind her, with the other being neutral aerial, making it a good replacement to her down smash to hit both sides. 8% (leg), 6% (foot) A legsweep. This lowers her hurtbox moreso than her crouch, allowing her to duck under most projectiles with proper timing. This move is great for setting up combos. 8% (clean), 5% (late) Activates her Jet Boots to perform a jet-propelled knee strike. 5% (hit 1), 11% (hit 2) A mid-level side kick, followed by a spinning side kick at a slightly higher angle. Due to it activating her Jet Boots, the second hit has a visible sweetspot in the form of a small, fiery blast at the tip of her foot. Unlike typical sweetspots, it has the same damage output as the sourspot; the only change is that it has slightly higher knockback scaling. Her side smash can be angled, but only the second kick changes in angle. 4% (hit 1), 0.8% (hits 2-6), 3% (hit 7) Spins in place while twirling her Plasma Whip overhead. Slant Paralyzer 8% (near), 6% (far) Aims her Paralyzer downward in front of herself and fires a paralyzing energy blast at the ground. This move has poor KO potential, instead being used to initiate combos. Opponents are paralyzed much longer at higher percentages. 8% Spins in midair, swinging her Plasma Whip laterally around herself. Has low ending lag, allowing for combo opportunities if used from a short-hopped fast fall. 5% (hit 1), 7% (hit 2) A hook kick, followed by a roundhouse kick. 12% (foot), 10% (leg) A spinning hook kick behind herself. 6.5% A bicycle kick. Thanks to its minimal start-up and ending lag, very low base knockback and very high knockback scaling, and low landing lag, it boasts excellent juggling potential. Slash Dive 6%, 5.5% (landing) A diagonal flying kick, similar to Sonic and Sheik's down aerials. The hitbox at the beginning can meteor smash. Has the slowest startup lag of all of her aerials. Due to this move being a stall-then-fall, it is extremely risky to use off-stage, so it is rarely used as a meteor smash as most of times it can lead to a self-destruct. Even when she lands on the ground, there is high landing lag, making it easy to punish. Despite this, its extremely fast descent speed can enable it to counter a juggle if there is sufficient distance between Zero Suit Samus and the opponent. Plasma Whip 5% Lashes in front of her with the Plasma Whip. Plasma Whip — Performs a kneeling lunge to unfurl the Plasma Whip. A hitbox appears at her hand, allowing her to grab opponents with less lag. 5% (hit), 4% (throw) Kicks the opponent away. 2% (hit), 6% (throw) A mid-level roundhouse kick. 2% (hit), 8% (throw) A backflip kick. The most damaging out of all of her throws, as well as her strongest throw. 4% (hit), 4% (throw) Pins the opponent on the ground, and performs an axe kick. 7% A modified butterfly kick performed from a windmill (a breakdancing move). 5% Performs a spinning low-level roundhouse kick. 9% Performs a low-level roundhouse kick while climbing up. Paralyzer 4~6% Assumes a kneeling position to fire a paralyzing energy blast from her weapon. It can be charged, which increases its damage output the duration of its paralysis, but at the cost of lowered speed. Targets hit by paralysis cannot be paralyzed again until making contact with the stage. Plasma Whip 2% (arm), 3.2% (whip, base), 1.2% (whip, middle), 4% (whip, held tip), 8% (whip, pressed tip) Performs a kneeling lunge to unleash the Plasma Whip forward in a swirling motion. The whip hits repeatedly, while its sweetspot, which is located at the whip's tip, launches opponents away, and can KO at high percentages. Alternatively, holding down the special move button will have the tip of the whip snap upwards, knocking opponents up and towards her. While the held version deals less damage, it gives Zero Suit Samus an opportunity for followups. Boost Kick 5% (hit 1), 1.2% (hits 2 - 6), 4% (hit 7) Activates her Jet Boots to perform a jet-propelled diagonal split-legged flying kick, followed by a spinning hook kick. One of her best KO moves against a midair opponent. It can also be angled forward or backward, which allows it to catch an opponent's air dodge, rolls and edge get-up reactions. Flip Jump 8% (stomp), 14% (kick) A 720° Ce Kong Fan, a jumping technique used in contemporary Wushu. It functions as a third jump and grants intangibility on frames 3-12. It can deal damage in two ways: upon contact at the end of the jump, or by pressing either the attack button or special button during the jump. Upon contact, Zero Suit Samus performs a footstool stomp, which buries grounded opponents and meteor smashes aerial opponents. Pressing the attack or special buttons makes her perform a diagonal flying kick, which is very powerful. The flying kick also has a sweetspot at her foot that can meteor smash aerial opponents, but has slightly less knockback against aerial opponents. Zero Laser 1.2/1.6% (laser loop), 20/25% (final burst) Zero Suit Samus leaps up, rising into the air, then appears atop her Gunship in the background, wearing her Power Suit. A player-controlled crosshair then appears, and after a short amount of time (or when the attack button is pressed), the now-suited Samus begins firing her Zero Laser with an area roughly equal to that of the crosshair. Like the version used by her suited counterpart, it hits multiple times. Opponents take more damage closer towards the center of the crosshair. At the end of the move, there is a brief pause, then one final burst is fired with enough power to launch opponents. Once the move concludes, Samus reverts to her Zero Suit and returns to her previous position. Jumps out of her Gunship and uses her Jet Boots to briefly hover before landing. Up Taunt: Tosses her Paralyzer into the air, spins once, and catches it behind herself while saying "Is that all?" Side Taunt: Swings the Plasma Whip in a circular motion while saying "Try me." Down Taunt: Holds her Paralyzer near her waist, and then performs a pirouette while twirling the Plasma Whip around her body and saying "You're mine." Stands up straight and looks around, holding her Paralyzer towards her face. Makes configurations to her Paralyzer. Slashes the air twice with her Plasma Whip and says "Be still." Uses Flip Jump and then performs a jet-propelled somersault while grunting. Performs a stretch kick and then swings her leg into position to perform a modified passé while grunting. Choco - The best Zero Suit Samus player in Japan. Placed 9th in Umebura SP 2. Juice - Placed 17th at Glitch 6 and Collision 2019. Marss - The best Zero Suit Samus player in the world. Placed 2nd in Heart of Battle, 25th at GENESIS 6, 1st at Collision 2019, and 1st at Full Bloom 5. Nairo - Placed 4th at Let's Make Moves. Classic Mode: Grapplers! Whips! Claws! Zero Suit Samus's opponents are characters who use tether recoveries. 6 6 Little Macs 75m (Battlefield form) Tunnel Scene - X Items are absent. Although Zero Suit Samus does not appear in the World of Light opening cutscene, she was vaporized and later imprisoned alongside the rest of the fighters (sans Kirby) when Galeem unleashed his beams of light. Zero Suit Samus' awakening battle is separate from that of Samus, who is vaporized in the opening cutscene. Zero Suit Samus can be found and awakened in the upper-right volcanic area in the World of Light after defeating the Metroid spirit. Zero Suit Samus's Fighter Spirit can be obtained by completing Classic Mode. It is also available periodically for purchase in the shop for 500 coins. Unlocking Zero Suit Samus in World of Light allows the player to preview the spirit below in the Spirit List under the name "???". As a Fighter Spirit, it cannot be used in Spirit Battles and is purely aesthetic. Each Fighter Spirit has an alternate version that replaces them with their artwork in Ultimate. Zero Suit Samus' fighter card. Zero Suit Samus on Wrecking Crew. Performing her down tilt on Coliseum. Performing down smash on Frigate Orpheon. With Samus on Gaur Plain. Crawling with Snake on Shadow Moses Island. Using her back aerial on Sheik on Luigi's Mansion. Ridley's reveal trailer marks Zero Suit Samus' first appearance in a cinematic CGI Smash trailer since Super Smash Bros. Brawl. Despite no longer being linked by in-battle transformation, Zero Suit Samus temporarily dons the Varia Suit during her Final Smash. This makes Zero Suit Samus the only playable alter-ego of a different character to make a limited appearance as said character during her Final Smash only. Zero Suit Samus is the only alternate incarnation or alter-ego of a starter character to not be in that character's Classic Mode character unlock sequence, as she is in Fox's rather than Samus'. This may be due to her unique moveset, as Dr. Mario, Young Link, Toon Link and Pichu are all clones or semi-clones. For unknown reasons, Zero Suit Samus's taunt voice clips aren't present in the Sound Test. In the Japanese version of Ultimate, characters' voice actors and actresses are credited by name. In the case of Zero Suit Samus, Alésia Glidewell's name was cut short, resulting in "Alesia Glidew". This has since been fixed. Zero Suit Samus' character showcase video, unlock battles and Classic Mode credits use "Theme of Samus Aran, Space Warrior" from Super Metroid, a game where the Zero Suit did not yet exist. This may be a reference to how Samus would appear in various states of undress during the game's ending sequence, as "Theme of Samus Aran, Space Warrior" serves as the end credits theme for that game. Zero Suit Samus being unlocked using/immediately after Captain Falcon may be a reference to how the two have been depicted as "rival" bounty hunters in Event Matches in Brawl and for Wii U (along with Samus' suited self in Melee). This is the first game where Zero Suit Samus's default head icon depicts her hair tie as its natural red, as both previous depictions have matched the Zero Suit's cyan. 1. ^ translates to "Aerial Cartwheel" or "Side Somersault"
This page was last edited on April 18, 2019, at 18:13.